Eleven years ago I set out to write A DANCE LIKE STARLIGHT that honored one of the African American pioneers in ballet, Janet Collins. But as I wrote this story about a little girl who sees Miss Collins’s performance, and as a result believes her own dreams can come true, I was also drawn to the mother in the background of the story who has not achieved great status, but who has worked hard every day of her life to provide the simple necessities her daughter needs. To me, one of the most important threads in this story is the mother’s sacrifice, because it reflects her love and selflessness in fostering her child’s dreams, allowing her to believe she can achieve something that might seem out of reach. This is one element in the story that, for me, reaches across culture and race and reflects an emotional truth that isn’t limited by the color of our skin. Certainly there are mothers who do not embody this kind of belief in their children, but there are mothers across the world, of every culture, that do and whose children point back to that belief as a guiding force in their lives. A recent reviewer of A DANCE LIKE STARLIGHT pointed out that the book never shows whether the little girl in my story achieves her dreams. (In my heart I responded, “Well, the reader is smart enough to figure out what they think about that themselves!) But for me, leaving the story open-ended provides a poignant sense of possibility. Both Janet Collins and the mother in this story are heroes who accomplish great things for this little girl. We are shaped by what we witness, whether it’s a performance that allows us to believe we can achieve something beyond what society expects of us, or it’s the consistent, quiet, daily example of a mother who is determined to give her child a foundation that will allow her opportunities she might not have dreamed possible. It is not important to know whether the little girl achieves the dream she had in that moment. Her dreams will grow and possibly change. She may actually grow up to dream a different dream. But from her mother she has seen that dreams are valuable and from Janet Collins she has seen that they are possible. Whatever her dream becomes, she can believe it true. To my own mama, who dreamed every dream I ever had right along with me. From dreaming to become a Olympian gymnast, to dreaming to be a recording artist, to dreaming to perform on Broadway, to dreaming . . . well, so many different things. All those dreams I dreamed as a child? I never accomplished many of them. I worked hard for many years on some of them. My mother supported and invested and believed. But her involvement in my dreams taught me that it didn’t matter whether I accomplished them or not. What mattered was who I was becoming and that learning to dream beyond myself and what I could accomplish would teach me who I am and who I should be. Learning to dream beyond myself would not only change me, but could change the world around me. I’m still dreaming. I’m still learning who I should be. That’s the way dreams are. As we grow, they grow. But this dreamer that I continue to be today, I owe to my mother. If my dreams allow me to change the world in any way, it’s my mama’s belief in me and example to me that made it possible. Happy Mother’s Day, Mama. Thank you for teaching me to dream. 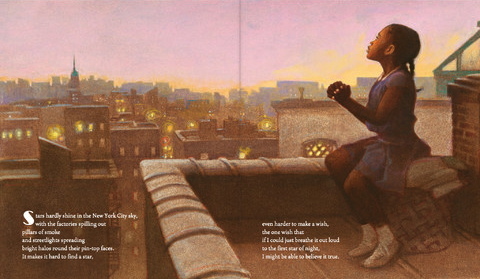 We need diverse books because all kids are dreamers. 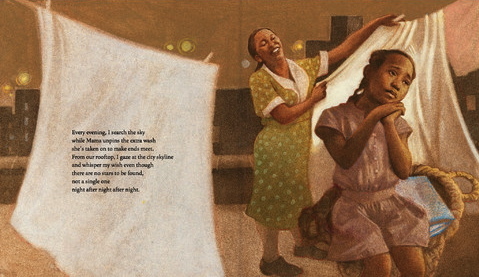 Image from A DANCE LIKE STARLIGHT by Kristy Dempsey, illustrated by Floyd Cooper.